Order returned to the Scottish Communities League Cup last night with six SPL clubs beating lower league opposition. Not a cakewalk for them all - Inverness needed penalties to get past Stenhousemuir, St Mirren waited until stoppage time to get the winner against Hamilton - and their efforts appear to have been met with a wave of apathy. Apparently you could fit the combined attendance for the six games into Celtic Park and still have 30,000 empty seats. A round where a few upsets are taken to prove the theory that there is so little to choose between the leagues that the SPL should be dramatically expanded forthwith. A round where pitifully low attendances are taken to prove the theory that the competition has run its course and should continue only after extreme surgery. Quite comforting in its own way. Combining the two, reworking the league cup as part of the (hopefully) impending reworking of the league structure, might be a good place to start. But those are questions for another day, to be chewed over by the great and good of the Scottish game. In the meantime we can enjoy another fun game of cross-division "my attendance is bigger than yours" as Rangers host Motherwell at Ibrox. When the dust settled after the summer's soul searching it always seemed likely that Rangers would face SPL opposition at some point this season. The league cup draw was kind enough to throw up this peculiar spectacle relatively early. The last time Rangers and Motherwell met in this competition Rangers won a 2010/11 semi final 2-1 en route to the trophy. Less than two years later Motherwell sit top of the SPL - a Champions League qualifying appearance behind them - and Rangers lie second in the Third Division. At times I think we're maybe too close to recent events, too drained by the tedium of the ever decreasing circles of vitriol and conspiracy theorising that surrounds it, to properly appreciate how spectacularly the game has been turned on its head. All of which adds another level of intrigue to tonight's game. It's hard to imagine any other set of circumstance that would see a team that hasn't won away from home in the fourth tier enter a game against a side unbeaten in the top flight as favourites. But there we have it. Rangers are 6/4 to win. Motherwell are 7/4 to win. This is Scottish football and normality has been suspended for the duration. For all that their away form has been laboured, Rangers have scored 17 goals in five home games. But there's only one clean sheet in that run and they were shunted out of the Challenge Cup by Queen of the South. Motherwell will be their biggest test so far. And I'm still struggling to see how this one will go. If Ally McCoist can't motivate his players tonight then his position deserves to be questioned. And Motherwell's record against Rangers can't be ignored. The last time they won at Ibrox Tony Blair had only been Prime Minister for four days. He wasn't even bathing in creosote back then. Rangers to start strongly, maybe nick a lead and Motherwell to eventually prevail? A half-time/full-time home/away combo at 20-1 looks generous. In a game that would seem to promise goals you can get the same price for either side to win 3-2. I fancy it will be close and Motherwell might just nick it. I'd not be shocked if they don't though. Elsewhere this evening Aberdeen travel to Dunfermline as favourites - a label they've not always worn comfortably against lower league opposition. Dunfermline manager Jim Jefferies has apparently promised to "have a right good go." In seven games this season his side have lost only one, scored 18 and conceded just three goals. They look equipped for the job of right good going. Aberdeen have beaten only St Johnstone in the SPL and required extra time to get past Morton in the last round. I feel I should be more confident about Dunfermline's chances of pulling this off than I am. Perhaps I'm being persuaded by Aberdeen's resilience in saving a last gasp point in their 3-3 draw with Motherwell at the weekend. A nice simple 2-0 win for the SPL side? 9/1. Tempting. But would a lower league shock actually shock me? 2-1 to Dunfermline? 10/1. I might just settle for a Motherwell - Dunfermline double at 8.80/1. A Twitter correspondent was reminding me yesterday of the time I saved two penalties in one game. As my personal sporting achievements go that remains right up there with winning the Longniddry Gala Primary 4 Short Tennis Open (Doubles) and clinching the runners-up spot in the Hawkhill Hibs Supporters' Club Bowls Day Oot. I also like to think it's bestowed on me honorary life membership of the "goalkeeper's union." Goalkeepers, they say, are crazy. The charge sheet for the crime of craziness is probably quite long. But you'd guess John Burridge would feature extensively. Probably appearing as his own character witness. His eccentricities are laid bare in Budgie - The Autobiography of Goalkeeping Legend John Burridge. The japes, the capers and misadventures are recounted with glee. But there's a more complex side to the 'keeper who once hoisted himself onto the crossbar and perched their - Budgie-like - when his side were in the ascendancy. The extravagant warm up routines, the tales of his wife being asked to fling pieces of fruit at him as he sat watching the TV to test his reflexes. They all served a purpose. They kept him in the game. Playing, coaching, managing. 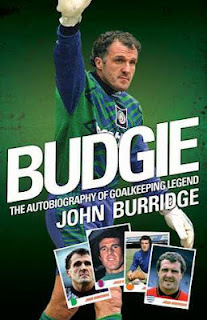 Without that what was there left of John Burridge? It took an intervention and a spell in The Priory before he found the answer to that question. Many are the stories of football as a cause of addiction or the setting for addiction. This is different. This is football as the addiction. The book begins with that episode. A dramatic opening to be sure but one that does colour what comes after. Because there is darkness to some of his behaviour that goes beyond the light-hearted eccentricities that you can tell he'd love the reader to shower with unconditional love. The constant battles with managers - recounted here as heroic Budgie against ignorant authority - point to a man burdened by the weighty chip on his shoulder. By the end of the book Budgie has turned from the lovable scamp of his imagination into a bitter ex-pat (albeit one who fell victim to a mysterious and serious road accident in the Middle East), pining for an England that probably never existed and certainly one that he'd not have known growing up in a Cumbrian colliery village. You'd be waiting for a rant about political correctness if he hadn't already covered that with a typically sepia-tinged defence of his friend Andy Gray and Sky sexism furore. Lost worlds are a theme. It’s difficult to envisage any player in the modern era having a career to mirror Burridge’s. 30 clubs, the English and Scottish leagues from bottom to top and back again. And difficult to imagine any player getting away with quite so many "antics" - the practical jokes, the repeated fall outs with coaches, the studs sharpened to "do" the metatarsal of an opposing centre forward - in Sky's brave new world. Changes for the better or the worse? Budgie's not a dispassionate enough chronicler of his own life and times to answer those questions. Including the word "legend" in the title of an autobiography, the mood of nostalgia and the residual bitterness (the lack of international recognition clearly still rankles) suggests a man that's already made up his mind about his place in the world. He's just waiting for the rest of us to catch up with him. Which is all a bit of a shame. Because this was a career that was extraordinary in its own way, a career marked by an ability to connect with fans that is beyond many a footballer. And if you like your anecdotes unseasoned by subtlety there's much to enjoy here - you won't read a more self deprecating tale of a footballer losing his virginity, you might never read again of a Hibs goalkeeper riding his moped through the streets of Edinburgh, discovering too late that someone has deposited a "present" in his crash helmet. All of that, much like a career taking in over 700 professional games but no England cap, doesn't quite satisfy. The Budgie that's uncovered is much harder to warm to than the lovable scamp of a goalkeeper of popular memory. That might be because he's never quite learned to warm to himself.